BRI is a 501(c)3 independent nonprofit medical research institute affiliated with the Virginia Mason Health System, located on the Virginia Mason Seattle campus. BRI is governed by a volunteer board of community members focused on seeing that the following vision, mission and strategy are achieved. A healthy immune system for every individual. To advance the science that will predict, prevent, reverse and cure diseases of the immune system. 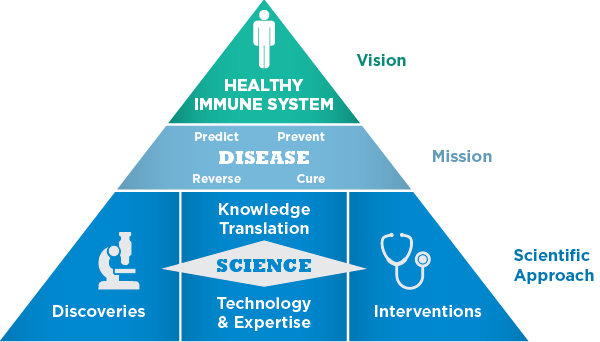 BRI’s strategy to achieve its vision and mission is to engage in scientific discovery related to how the immune system works, both in health and disease. Questions being addressed include how the immune system works to protect the body from disease and ways the immune system can cause disease. We are building on our prior success, expanding our mission to encompass immune health, autoimmune and allergic diseases and the impact of immune interventions to prevent, treat and ultimately cure disease. At BRI we recognize that to achieve our mission of one day preventing and curing immune disease, we need to understand differences: between individuals with and without disease, as diseases progress over time and before and after treatment. We have a large and growing biorepository of samples that allows us to investigate these differences, across populations all the way down to single cells. We generate and analyze huge datasets profiling genetics, gene expression patterns and frequency of specific types of immune cells that either protect or promote immune disease. From this we are able to build a more complete understanding of factors influencing health, disease, treatment response and the variations we find across individuals. The Research Conflict of Interest Policy is an important component of our research quality program. BRI is guided by community leaders who serve as the Board of Directors. The Board oversees our Institute's affairs, including finances and strategic planning. BRI is led by President Jane Buckner, MD, and Executive Director Margaret McCormick. Please read our Annual Report for more information about the latest BRI research advances or request a print copy.